I was sent this book for free from the author. The author sent me a digital copy of this book. I received this book as a review copy. Synopsis: If you had the chance to travel to a different period, would you do the same things? How does indecisive grad student Roland Hughes find himself cheating on his long time girlfriend Liz, with a rich, Ferrari driving, Lila Thurston, who involves him in her four hundred fifty thousand dollar heist? That's just the beginning of his woes. He has haunting visions of renaissance men and women pulling him back to a time of witchcraft, magic, curses and alchemy. Roland pays dearly for his fling with Lila, and desperately wishes for another chance. The cosmos hear him, and deliver help with the enchanted alchemist cabinet for a new life and time. Will he redeem himself or chase the same temptations? Time travel to the age of alchemy. Review: This is an interesting book that I really enjoyed reading. I found that it took me a few pages to get into the book but once I was into the book I couldn't stop reading. I was so lost in this book that I had it finished within a few days. 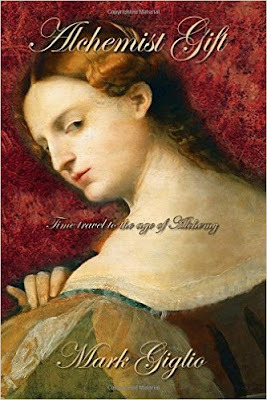 I would recommend this book to any reader who enjoys reading fantasy and time travel stories. I enjoyed this book so much I plan to invest in a paperback copy of this book so it has a permanent place in my ever growing book collection. I would like to thank the author for giving me a chance to indulge in such an excellent read.